491 Gateway Blvd, Brunswick, GA, 31525 - Photos, Videos & More! The Property is located in what is considered the primmest commercial area in Glynn County. This is due to the fact that it is contiguous (separated by Gateway Center Boulevard) to the Canal Crossing development. Canal Crossing is a 345,253 square foot shopping center anchored by Sam's Club (134,550 sf), Hobby Lobby (55,000 sf), HomeGoods (20,000 sf) and Academy Sports (63,000 sf). In addition Panera Bread and Panda Express will be located within Canal Crossing and possibly Cheddars Restaurant. 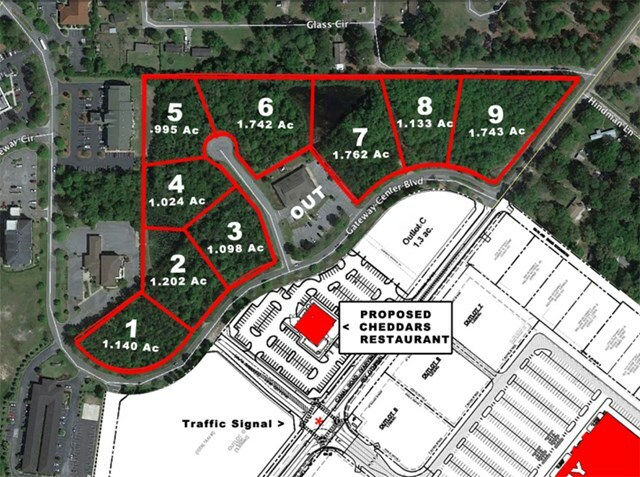 The Property is located within 1/3 mile of 5 hotels, numerous office buildings and a 400 unit apartment development which is currently under development named Enclave.